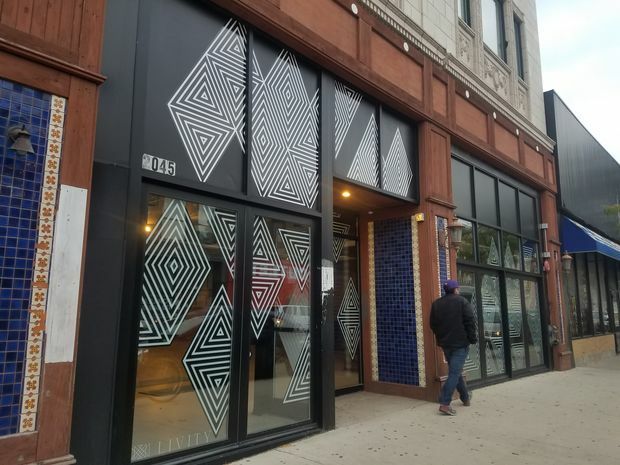 LOGAN SQUARE — Complete with a rickshaw, psychedelic murals and walls bathed in patterned strobe lights, new Logan Square yoga studio Livity aims to attract artists, creative types and those eager to stretch their bodies at 10 p.m. on a weekday night. "This location really found me. A lot of the neighborhood is changing and losing the creative and artistic influences that made it great. We wanted to build a space for creative and conscious people," Livity's owner Corey Kelly said during a tour this week. 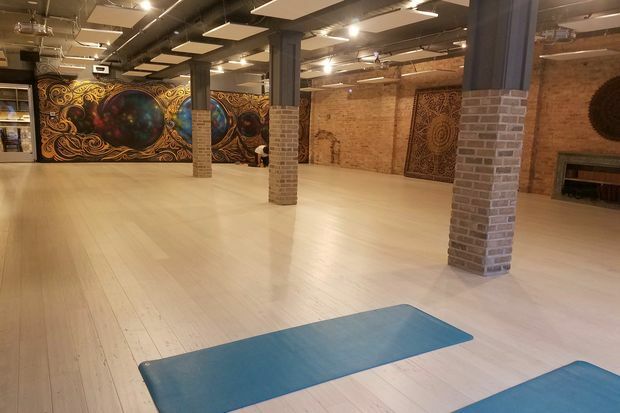 Next to Concord Music Hall, the massive 7,500-square-foot Livity Chicago is planning to offer two free yoga sessions on Thursday night for the curious to check it out during its opening week, Kelly said. 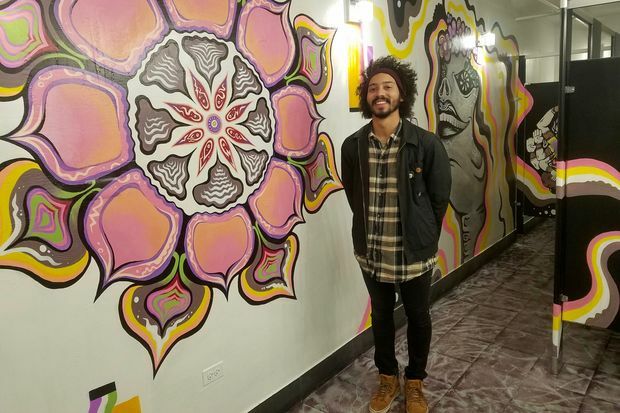 Kelly described Livity, 2049 N. Milwaukee Ave., as "a gathering place for the conscious and creative community, comprised of those who are actively working to elevate themselves to their greatest potential and those who seek to improve." Livity draws its name from a Rastafarian term for energy and connection, Kelly said. Thursday's complimentary 6:30 p.m. class will be taught by Yogi Danny Benoit, who goes by the name "Danny Be" at Livity. Kelly will teach a free 8:15 p.m. class. Both of the classes will be heated yoga sessions — offering temperatures between 85 to 100 degrees. The center uses a radiant infrared heating system, where the heat radiates evenly from the ceiling and not through a blower system. The yoga room, which can accommodate up to 80 students, features a rickshaw that people can sit in before or after class. 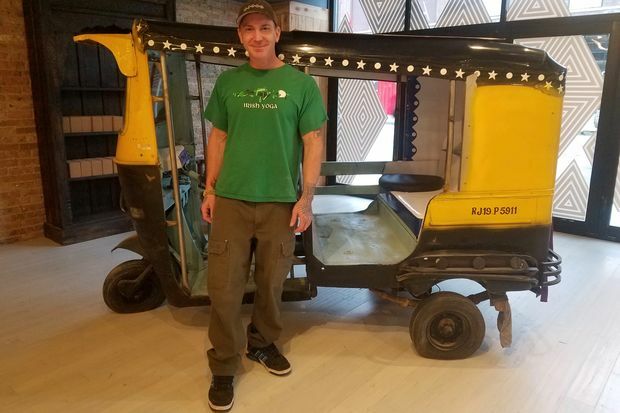 Kelly said he found the rickshaw at an antiques store in the suburbs and thought it would be a good fit for Livity. "The store had it on sale and wanted to get rid of it. I love India, and for people to see something from there in the class, it adds to the experience," Kelly said. Taught by a mix of five instructors, Livity's classes will run as late as 10 p.m., with a discounted $10 class at 10 p.m. on Mondays and Wednesdays. See all of Livity's rates and schedules here. 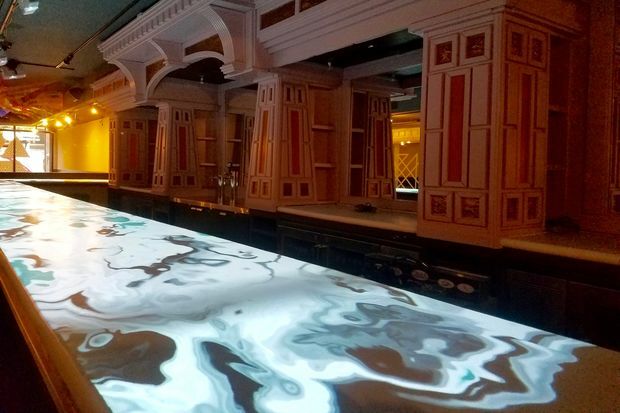 An adjacent 84-seat lounge will serve herbal nonalcoholic drinks and food in about a month, after the yoga studio is fully underway. 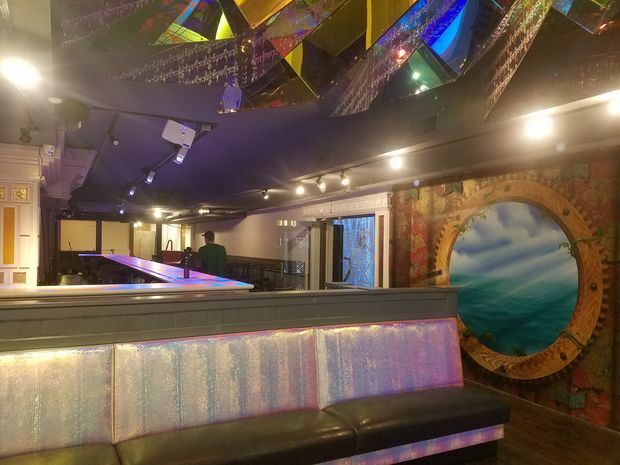 The lounge features a mural by Logan Square artist Jason Brammer along one of the walls. "We cannot wait to share this beautiful new space with you. 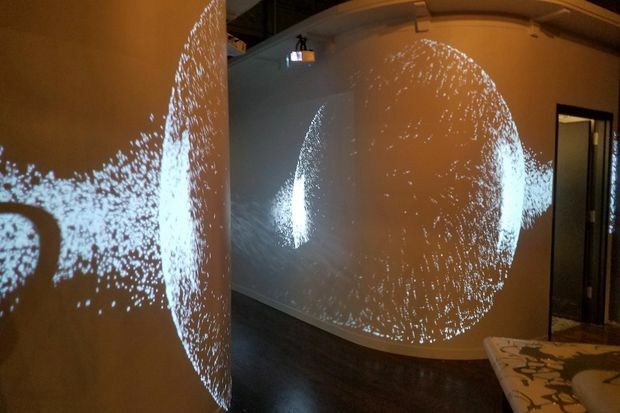 Our conscious community center, our urban temple, a place for us all to grow, to glow and let go, cause you know we grow together," Danny Be said in an introduction video on Livity's Facebook page. The herbal drink and food lounge. Mural artist Keith Smith in the women's bathroom, alongside his work. 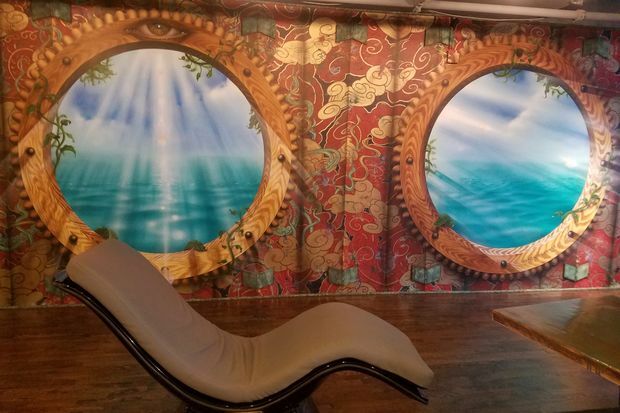 A relaxing reclining chair in Livity's lounge and a mural by Jason Brammer as backdrop. 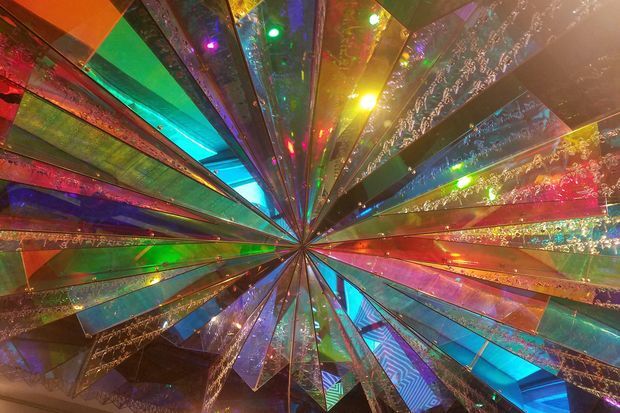 An iridescent ceiling in Livity's drink and food lounge. 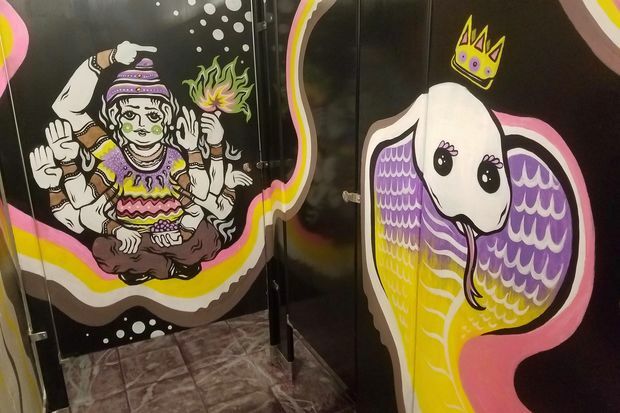 Murals by Keith Smith on the women's bathroom doors. The hallway between the yoga studio and cafe. Livity drink and food bar counter bathed in patterned lights. Livity is now open at 2045-2049 N. Milwaukee Ave.